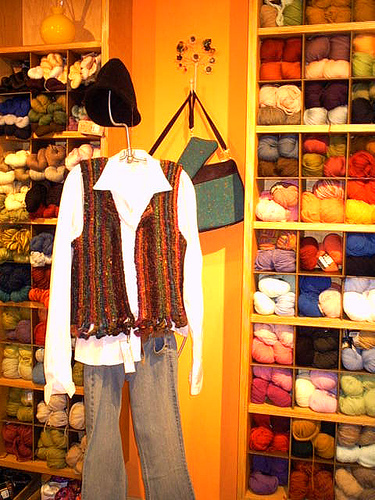 The great thing about this stylish, versatile vest is that, since it is knit sideways, you knit it to fit your size. When you get to where your armhole is, you begin the armhole…It’s really that simple! Because it is knitted in this way, this pattern will “talk” you through construction versus giving specific numbers. DI = Double Increase. Work a double increase like this: do a regular increase (knit into the front and the back of the stitch), but instead of lifting it off of the left needle, you knit into the front of the stitch again, and then lift it off, thereby making three stitches out of one. Knitted cast on: knit a stitch without lifting it off, and place the stitch you just made onto the left needle. Row 1: Your first 10 stitches (up to the stitch marker) will create your “curly fry”. Do a double increase (DI) into each of these 10 sts. Slip marker and knit to the end of the row. Row 3: BO all stitches before the marker (29 stitches; one left before the marker), slip marker, knit to the end of the row. Row 6: Knit, then turn your work and using the knitted cast on, cast on 9 sts. Repeat rows 1-6 for 3 inches, then CO 12 sts at the neck edge (opposite the “curly fries end”). Work until you reach your personal shoulder width. Bind-off as many stitches as desired for armhole. I bound off 25, some may prefer a deeper/longer armhole. You can find your number of stitches by measuring from the top of your shoulder to where you want your armhole to end, and then lay the measuring tape on a flat part of your knitting and count how many stitches that takes. Continuing in pattern, knit until the width of your armhole is done (my width was 4”), then cast on the same number of stitches you bound off to make the armhole (this is done on the opposite end from your “curly fries”). Continue in this fashion, making your “curly fries,” for the width of your back, until you reach the opposite armhole edge. Bind off the same number of stitches used on the previous armhole. Knit the width of your armhole (again, keeping your “curly fries” going! ), and cast on the same number of stitches bound off for the armhole. Knit the vest front for as many inches as you did on the other vest front, stopping 3” short of the edge. At the 3” mark, BO 12 sts at the neck edge to match the neckline on the opposite vest front flap. Your final BO row should coincide with a “curly fry” bind off row to have matching edge fronts. BO all sts. Sew shoulder seams. Weave in all ends and enjoy! All rights reserved. No part of this document may be reproduced or transmitted in any form, by any means (electronic, photocopying, recording, or otherwise) without the prior written permission of the designer, nor can the finished product be sold. How would I add sleeves to make a cardi from the vest? I can see how to make it longer. I really like the vertical stripes on Noro rather than horizontal! You could add the sleeves in later, or you could *not* indent for the armholes and add the length to “fold over” when done, if that makes sense…. What weight is the Noro Blossom? Thanks I appleciate the prompt answer!